Photo of Paul Johnson by Hannah Hartman. At age 7, Paul Johnson mimicked bird paintings while taking art lessons. Now, he’s channeled his creativity into publishing books about them. Johnson, Student Success Center coordinator at Middle Georgia State University's Macon Campus, will talk at November’s Ocmulgee Audubon Society (OAS) meeting about the history of birding in Middle Georgia based on his research for the his newly released 2nd edition of Annotated Checklist of Birds of Middle Georgia. Shortly after, Johnson joined the OAS to share his passion with others and has since been a long-time member known for his exceptional bird call knowledge. However, his book is not the only thing Johnson has expanded upon. 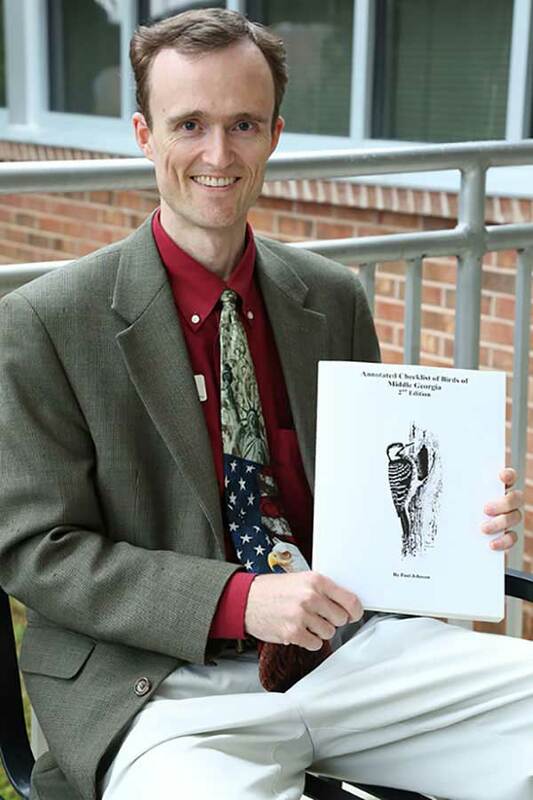 Johnson’s newly released 2nd edition of Annotated Checklist of Birds of Middle Georgia is available on Amazon and copies will be available for purchase at this month’s OAS meeting on Monday, November 12 at 7:30 p.m. at the Museum of Arts and Sciences located at 4182 Forsyth Road in Macon. Editor's note: The writer, Alexandria Brooks, and the photographer, Hannah Hartman, are both MGA students currently interning in the University's Marketing and Communications office.